So, I’ve received permission to reveal this, exclusive to this site, as the full size cover art for Daylight on Iron Mountain. I’m told there might be adjustments, but for all intents and purposes, this is the cover of the next Chung Kuo novel in all it’s high-res glory. Click the picture for highest resolution. Daylight on Iron Mountain news! 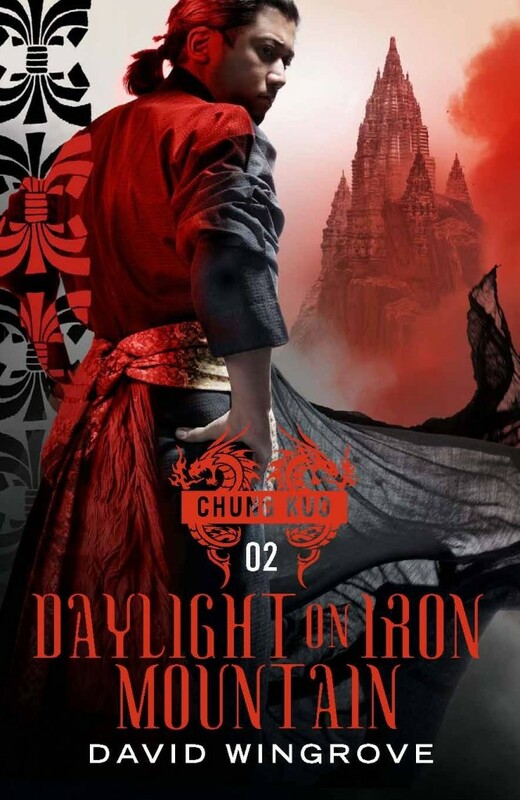 The Corvus website has now listed listed entries for Daylight on Iron Mountain, Book 2 in the Chung Kuo series. The Special Edition publication date is listed as October 1, 2011; the hardcover and ebook versions on November 1; and the paperback on June 1, 2012. Looks like it’s going to weigh in at 416 pages, short of SoH‘s 480. CHANGE IS ON THE AIR: The generals of the Middle Kingdom await the decision of the emperor.The campaign to secure the border from China to Iraq has reached a strange impasse. Two blood enemies, Arabs and Jews, have united against their common cause. But with the lives of thousands at his whim, the exalted Tsao Ch’un, the Son of Heaven, cannot decide. Destroy the Middle East in one blinding flash? Or take another path? BUT THE WAY IS UNCLEAR: In the court of Tsao Ch’un, men of power have become smiling lackeys, whose graces conceal their fear, or their ambition. A man that can be trusted absolutely is a rare thing. And so, with his family held hostage by the empire, General Jiang Lei finds himself appointed to a special task: the orchestration of the last great war against the West. The total dominion of America. WAR APPROACHES: But life in the world of levels continues. No hint of war, or want, or discontent can infiltrate the oppressive, ordered society that replaces the world Jake Reed once knew. Since the first airships rolled over the horizon, nothing has been the same. His new life means new thinking, new customs, a new way of behaving, and with his every move scrutinized, Jake can only serve the bureaucracy of new China. But he is not the only citizen who feels discontent with the anodyne new order. And here’s the teeny tiny thumbnail of the cover. Posted on April 6, 2011 April 6, 2011 Categories NewsLeave a comment on Daylight on Iron Mountain news! This is not a dictatorship. …it is a fan blog, after all. And I know I’m not the only fan (as evidenced by some action on the Forums after only one day of being live). If there is anybody who has reflections, opinions, fair criticisms, breaking news, or any other relevant info about the Chung Kuo series, then I’d love to have some other contributors to this site. In the interest of full disclosure, I do (and will continue to) receive the revenue from the Google ads at the right in an attempt to recoup the funds that pay for the domain and hosting of this site — so far I’m up to around $1.79 or so after two months, not quite enough to quit my day job yet. Also, as the administrator of the site, I’ll retain editorial control of all the content, which isn’t to say that I won’t agree to the posting of entries that I disagree with (quite the opposite! ), but I do want to maintain a certain standard of content, including relevance and quality of writing. Indeed, a thorough command of the English language is an expected pre-requisite. What I’m thinking is that I’ll post your first entry (under your name or nickname), and for any further content I’ll create a WordPress username and account for you. If anyone’s interested, hit me up at ofgiftsandstones [[at]] gmail.com and we’ll discuss how we’ll get started! Posted on March 29, 2011 Categories News2 Comments on This is not a dictatorship. Son of Heaven: Out in hardcover now! On this day, back in 1857, the Second Opium War was started when Britain and France declared war on the Qing Dynasty of China after it refused to open its ports and legalize the opium trade. The aftermath set the stage for the next century and a half of relations between China and the UK, culminating in the return of Hong Kong to Communist China in July 1997. Coincidentally, Son of Heaven has just arrived in hardcover. Go get it. And if you’re in London, make it a point to head out for the launch party! If you’re in the states, you can import it from Amazon UK here. Posted on March 3, 2011 Categories NewsLeave a comment on Son of Heaven: Out in hardcover now! Son of Heaven Launch Party! Mr. Wingrove will be officially launching the hardcover version of Son of Heaven on Thursday, March 3, at the Forbidden Planet Megastore on Shaftesbury Ave in London at 6pm. It’s a bit of a trek for us Yanks, and I won’t be making the cross-Atlantic voyage. But, if you’re in the area, it’ll be an event not to be missed. I understand he’ll be doing some signing and talking about the series and all that good stuff. Although not stated on that site, I’m told that you should RSVP with Mr. Wingrove’s publicist, Becci Sharpe, via e-mail at beccisharpe [at] atlantic-books.co.uk. Posted on February 25, 2011 Categories News1 Comment on Son of Heaven Launch Party! There’s an interview up with David Wingrove on The Scotsman about Son of Heaven. Cook up some haggis, throw on that kilt, [insert another lame Scottish stereotype here], and follow the link below to check out the article. This site just got a shoutout from Mr. Wingrove on Twitter and Facebook! I’m thrilled and totally honored. And yes, I’ve finished Son of Heaven. Final reflections coming soon. Posted on February 14, 2011 Categories NewsLeave a comment on Holy Wei Chi, Batman! Where did it all begin? When was that first step taken on that downward path that led to Armageddon? Fourteen years ago, Marriage of the Living Dark, the last book in David Wingrove’s massive critically-acclaimed Chung Kuo saga was published. After a tragic misunderstanding with the publisher, Mr. Wingrove was forced to condense two books’ worth of material into that last volume. The result left both the author and the reader unsatisfied. Today, February 3, 2011, the cycle begins anew. The Chung Kuo series has been recast from 8 books into 20 volumes, jam packed with new material, including two new prequels and a reconstructed ending. The Kindle version of Book 1: Son of Heaven is now available (here in the USA, here in the UK). For those few diehard fans of the series, this is simply a dream come true. For those yet to experience the series, they have a new world in store. The Chung Kuo series, when originally published, had only a modest web following, hosted graciously by Bob Newell. The new official website is great, and for us long time Chung Kuo fans, it’s given us an oft-wished for portal to Mr. Wingrove’s creative process. But, with this blog, I hope to pick up where the old fan site left off and provide a forum for all things unofficial for the amazing world of Chung Kuo. And who am I? Just a fan who’s read through the entire original series twice and has always hoped another glimpse into the spellbinding world of Chung Kuo. It’s been a long, long wait, but we finally have our opportunity. 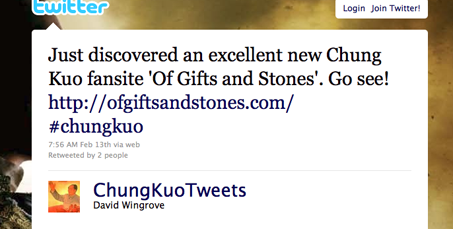 The title of this blog, Of Gifts and Stones, was the title to the synopsis of the story-thus-far that was featured in the beginning of the later books, kind of a “Previously… on 24” for each new novel, initially called The War of The Two Directions in Book 5 (Beneath the Tree of Heaven), at least in the American edition that I have. At that point it was only two pages, which grew to 17 in MotLD. That’s a lot of ground to cover! It was a much-appreciated addition, and the title always stuck with me. It’s a thinly veiled reference to when… well, let’s not spoil anything. At this point in the reboot, it’s a long way off… Anyways, I hope that this blog similarly covers a lot of material, so Of Gifts and Stones seemed like an appropriate title. Keep an eye on this space for periodic news, updates, opinions, and more! Disclaimer: This blog is not endorsed or affiliated by David Wingrove, Corvus, or anybody else, and all opinions are my own, etc., etc.